This is an update of computer technology at KRMS for the beginning of the 2008-2009 school year. As soon as we can schedule the time, we are ready to set up this year’s seventh graders and new eighth graders onto www.thinkquest.com. I have already assigned the user names and passwords. If you do not have a think account, you should see me. “Think” is not only a great way for students to access their work on line, it is very teacher friendly as well. Check out Rebecca’s or my think sites and see how we are able to communicate with the students, parents and teachers. If you would like help setting up your “think” site, let me know. Creating a site is very user friendly. In essence, all my students have their “binders” on line. They also know to regularly check my list of projects that I post to all of their sites. Everything is in one place. All the students have to do is access their own ThinkQuest sites. The computer lab is already starting to book up, so please see me to reserve computer time. Remember that I am here to help all of you integrate computer technology into the classroom. This can be done either in my room or in your rooms using the laptops. I have ideas for all subject areas. I also welcome yours. Check out the Portaportal Section of the Kingswood Regional Middle School Website. I am regularly adding interesting sites in all curriculum areas. There are some really cool sites out there and most of them are free. If you have any pictures or news to put on the expanding KRMS website, please see me or put whatever you have in my box. We have gotten a lot of positive feedback about the site, especially the podcasts and videos that have been posted there. Now that we have the permission forms to post pictures, we also plan to use more images of student activities to make the site more interesting to students, teachers, and parents. I got the following mantra from Susan Phillip’s Blog. It sums up my view of life better than I could have expressed it. She is a principal in Jacksonville Florida who blogs. As an educator, I can’t imagine life without blogs. It is amazing the ideas and insights that are being shared on cyberspace. We could also be sharing project ideas on thinkquest. Think.com will be used at Kingswood Regional Middle School so that students can work on projects at home and at school. As the school year progresses more and more teachers will be adding students to the think.com roster. Parents can access student work by using their child’s user name and password. Here is an overview of the computer projects in the computer class at Kingswood Regional Middle School. Includes copying layouts and then creating content of their own with similar designs. Periodic typing drills to expose students to the proper typing techniques. Web Quest on the Andrea Doria and the Stockholm-to further the development of Internet search techniques. This may take up to a week but not every student will get to it. Sim City-game simulation to encourage problem solving, expose students to non-violent yet engaging games-encourage reflection and to create a situation where students have to use their thinking skills to figure out the logic of the games. Learning how to use different programs requires the ability to figure out the logic of those programs. It is a very important skill. One week, but students are given time a various other times to work on their final city. Math game used periodically the last fifteen minutes of a class to reinforce basic math concepts in a fun way using technology. www.quizlab.com Quizzes I have created to reinforce technology vocabulary and computer safety-students take the quizzes repeatedly and receive immediate feedback. One day and then on going on their own time. Internet Scavenger Hunt 2- research techniques reinforced-this time two to three days is usually enough. Students choose to make a short digital video, work with digital photography, or create a website-in groups students are exposed to skills necessary to complete individual and group projects. Video Students critique short videos in the advertising media using specific guidelines, create a pitch, then story board, script, shoot, and digitally edit a short fantasy advertisement. Website students critique existing websites using specific guidelines, create a proposal, learn how to make websites, make three page websites and link them all together. All groups need to plan their projects, as part of their proposals, using flow charts created in Inspiration. During the final four week period,students must, in addition to their group projects, individually create a ten slide research PowerPoint type project using Open Office Impress. Students may choose to complete any other projects they may not have completed during the class. 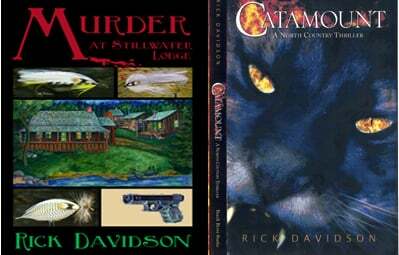 My novel, Catamount A North Country Thriller has been published. Man’s sacrilegious infringements on Nature’s delicate balance calls down a forgotten Indian curse and releases a raging mountain lion, a catamount in the North Woods. This creature is not supposed to be there and is not supposed to prey on humans, but two young children and their dog pick up its trail behind an isolated summer camp not far from the Canadian border. The children do not return and a search and rescue party sets out after them, but the rampages of the malevolent ghostlike cat hinders their efforts and a violent storm sets off a serious forest fire in the tinder-dry forest. As a computer technology teacher, I have not been asked this question often but it has been asked. My response has not always been the most convincing. Sometimes I have quoted some statistic that employers want such and such a skill from their employees. This is, of course true, but these statistics mean very little to a middle school student. Perhaps, I evoked the old adage that it is important to learn how to learn. Again, I strongly believe that this is true, but does this piece of wisdom mean much to a twelve year old. One thing I have observed, though, is that, in spite of themselves, even students in this age group can become totally involved in what they are doing if they are really interested. Witness that most middle school kids are capable of learning what they need to know to progress to different levels of video games. They are developing and using skills that require problem solving, reflection, and the ability to adapt quickly. Even students with learning disabilities are often capable of doing this. Maybe we should be encouraging more of these types of activities rather than discouraging them. The answer to the “why do I need to know this”, for me, might fall into the following categories. 1. To express the passion I feel, for stories and fantasy. I think this is what Bill Cosby was talking about. 2. Those stories whether they are in books, on TV, in movies, or photographic, all add to the quality of our lives. In many cases they provoke reflection and open us up to ideas beyond the limits of our own experience. You can learn how to make your own stories. 3. To learn how to problem solve and find solutions in order to produce a publication or product. To cooperate with other members of a group. 4. To understand that computers can make some tasks much easier. Certainly modern word processing beats the old fashioned typewriter for most people. How did I live without the ability to rewrite without starting from scratch? 5. To use the Internet as an incredible source of unlimited knowledge, communication, and, yes, fun. 6. It is not necessary to be a “computer guru”, to reap the benefits of day to day computer use. It is a source of information from finding the weather, the news to perhaps finding a mate. It is rapidly becoming the primary provider of music films, shopping, and, yes, even books. 7. Do some of us, students and adults spend too much time on a computer? Perhaps, but what a world it is. I don’t want to encourage computer addiction, but how does one of my generation express to the new generation what an incredible tool the PC is? Tools whether they are music making tools, video making tools, writing tools, web making tools, game making tools, or photographic tools bring out the potential of inner creativity. The list could go on, but I guess my answer to the student who wants to work in the woods cutting down trees would be to think about the possibilities that are now available to him even if that is his chosen work. The truth be told, I love working in the woods and spend a substantial part of my life away for all the innovations of the modern world. Maybe though I can somehow express my passion for all the opportunities that, I feel, have been opened up to me by the computer. I can only imagine what the future will bring. I also try to create projects that involve the students so much that they forget that they are learning, or for that matter, working. It works with some of the students a lot of the time, but not all of the kids all of the time. The concept still needs work, but I do believe we should start including those things that the kids themselves are naturally attracted to, such as iPods, gaming, and different forms of communication. It can be done in safe ways. We have, as adults, the tendancy to want to prohibit anything that can be abused. The reality is that the telephone, a car, the US Mail, and hand-written notes can all be abused. I would suggest that we ought to be encouraging our children to not only embrace technology, as most of them already do, but to also to use it wisely.